A rigid, plastic mold comes in handy for casting any shape with a design in relief. That is, any object where just one face has a three-dimensional design on it. These molds are widely available in stores, mainly for use with either food or polymer clay crafts. You can make your own acrylic mold by melting a thin sheet of plastic over a prototype. There’s no strict rule as to how thick the sheet should be, but thinner acrylics will melt more readily and give you more detail. Simple, well-defined designs work best. Turn your oven to 300 degrees F and give it 10 minutes to reach that temperature. Cover the surface of a baking sheet with aluminum foil and place the prototype on it. Your prototype needs to be made of a heat-resistant material such as metal or ceramic. If it is made of plastic, it will likely melt when you put it in the oven. Coat your prototype in liquid wax using a large paintbrush. Liquid wax will serve as a mold release. It will become liquid in the oven, but it will still perform its job. Balance a sheet of acrylic on your prototype and place the tray, acrylic and all, into your oven. 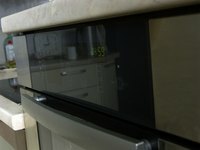 Turn on the oven fan to reduce fumes from the acrylic and crack open a window. Let it cook 15 minutes for ever ¼ inch of you acrylic. Remove the tray and set it aside to cool for an hour. Pry the prototype out from the mold and rinse any remaining wax off both the mold and the prototype.